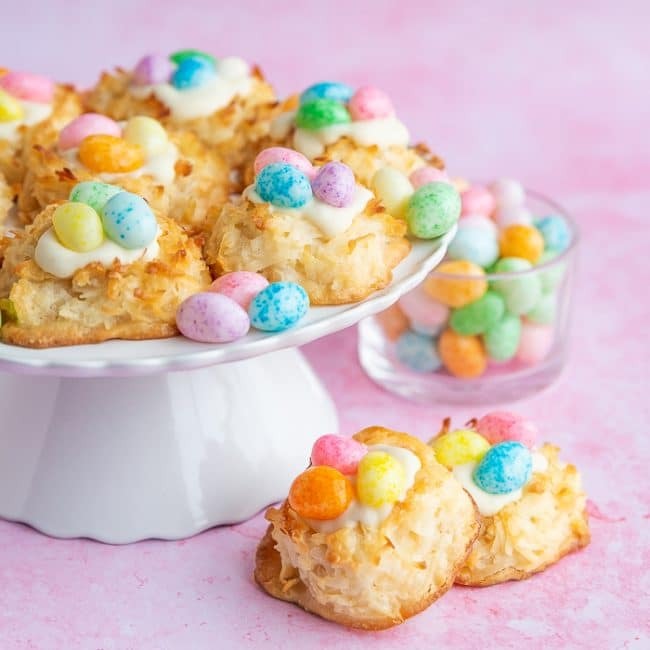 Delicious Coconut Macaroons are topped with white chocolate and jelly beans to create these adorable Birds Nest Cookies. This jelly bean topped cookie make a tasty and adorable Easter dessert! 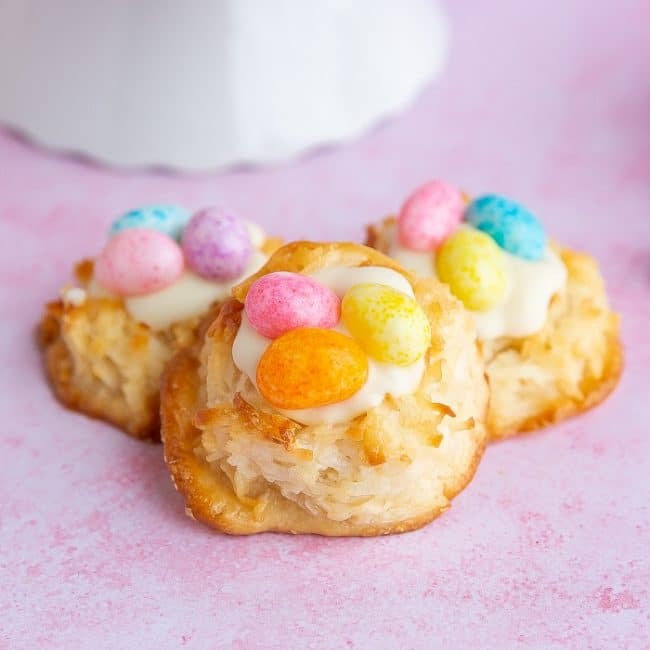 While I always like to make Macaroons for spring, topping them with jelly beans is a fast and easy way to dress them up for Easter. 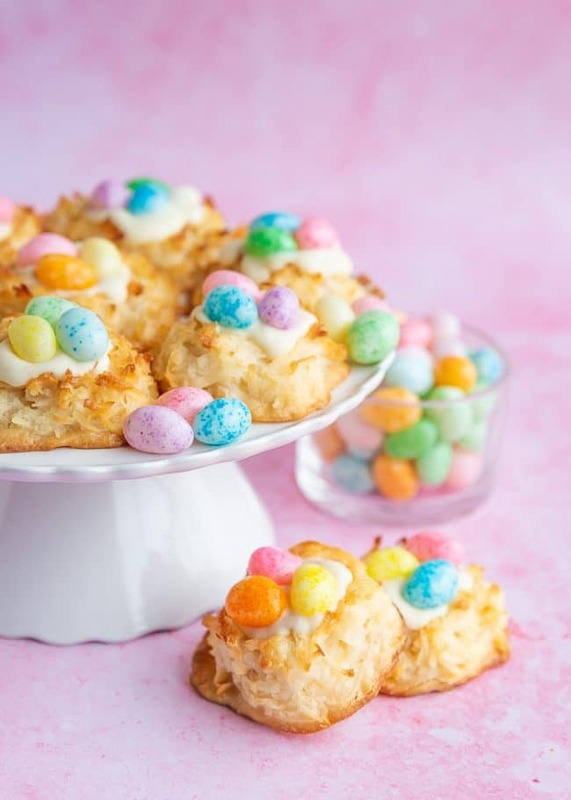 Any jelly beans that you have will work for these Easter cookies. That said, I think that the Speckled Jelly Bird Eggs from Brach’s look the cutest on them. For this recipe I paired my jelly beans with white chocolate, there are no hard fast rules to follow here. Feel free to get creative with whatever Easter candy you enjoy or happen to have on hand. Dark chocolate always pairs well with macaroons, as I shared with my Chocolate Dipped Macaroons. One of the nice things about these Birds Nest Cookies is that you don’t have to decorate them immediately. As long as you top with chocolate and jelly beans within a day, I think you’d be fine. Also, the decorating part of these is a great one to let the kids help out with. Delicious and easy macaroons become sweet Birds Nest Cookies thanks to some white chocolate and jelly beans. A great Easter cookie or spring dessert recipe. Preheat oven to 325 degrees F. Prepare a baking sheet with a silicone baking mat. Combine almost* the entire can of sweetened condensed milk (leave about 2 tablespoons in the can) with coconut. Stir to combine. Add in vanilla and stir to combine. Set aside. In a separate bowl combine egg whites and salt and beat until soft peaks form. Scoop or spoon mixture, about two tablespoons, onto baking sheets that are covered with parchment paper (sprayed with non-stick cooking oil) or silicone baking mats. By hand, gently shape a small indent into the top of each macaroon. Bake for approximately 25 minutes or until starting to turn golden brown. Remove from oven, then immediately remove cookies from baking sheet and transfer to a wire rack to cool completely. Once cooled, pour white chocolate chips into a microwave safe bowl. Microwave on 50% power for 30 seconds. Remove from microwave and stir. If not melted, return to microwave at 50% power for 15 seconds. Remove from microwave and stir well. If still not melted, repeat again for 15 seconds. Spoon melted white chocolate into the indent on top of each macaroon. Immediately top with three Brach’s Speckled Jelly Bean Eggs. Allow up to two hours for chocolate to set. *You do not need to specifically measure the sweetened condensed milk, just pour most of it into your bowl, leaving approximately 2 TBSP in the can. *Make sure to use a silicone baking mat (highly recommended) or if you don't have silicone baking mats, use parchment paper, sprayed with non-stick cooking spray. The sweetened condensed milk makes these quite sticky! *Gently remove cookies from the baking sheets IMMEDIATELY after they come out the oven. If allowed to cool on the baking sheet, it’s likely they will stick. A thin spatula works best for this. 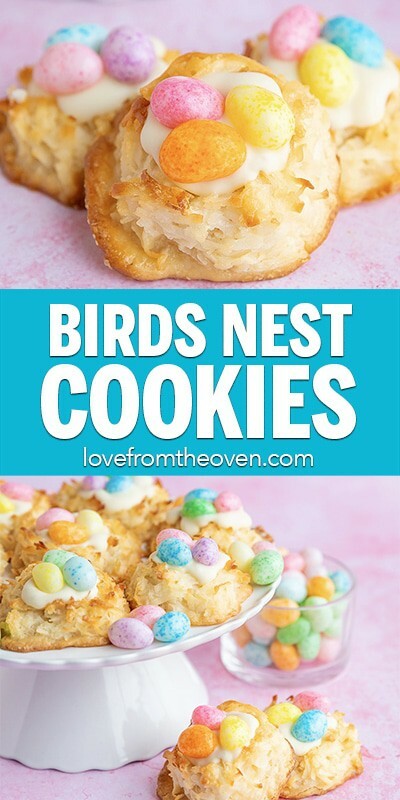 I hope your family enjoys these Birds Nest Cookies this spring!